In the normal course of any day we encounter opportunities to make hundreds of decisions. Your set of values are the filter through which you run every single choice you make, even the small ones. 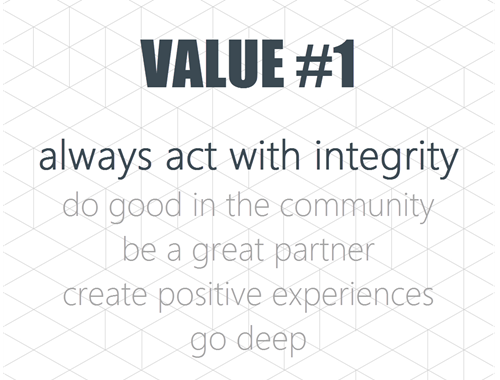 We use these values in every part of our day and in all our work. Our clients place trust in our team to be thoughtful custodians of their brands and businesses. They count on us to be good stewards of their relationships and the brand value they’ve created with clients and stakeholders. For us, that means we can’t take shortcuts. We don’t think short-term. When we must make a choice, we must make the ‘right’ choice, not the ‘easy’ choice. It also means that we get to examine our own relationships with clients, vendors, suppliers, and partners, and measure if we are either aligned or out of integrity with their values and what they believe. Our success is amplified when we’re in alignment with the beliefs and values of those around us, and when we can amplify the voice for those committed to good things for the good of others. Older PostCAN PEOPLE SEE YOUR WHY?